Rangemaster CRF 2400-R which measures up to an astonishing 2,400 yards (2,200 meters). Compared with its predecessor, Leica has added an additional 800 yards (731 meters) to the unit’s measuring capability. This provides superior usability to hunters spotting game and long-range shooters checking targets. The handheld laser rangefinder offers a newly designed LED display which increases precise readability of scanned distances and ballistic data. Another remarkable feature is the extremely fast scan mode, which takes measurements every 0.5 seconds. Up to a measuring distance of 200 yards (182 meters) the unit provides the results in decimal figures to 0.1 yard, enabling even more precise distance measurement, especially for bowhunters. 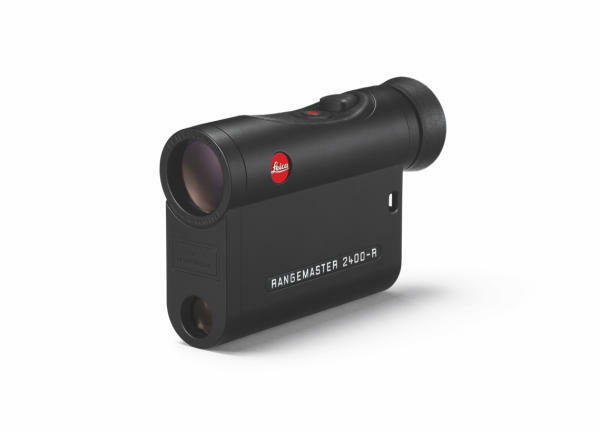 The Leica Rangemaster CRF 2400-R also determines the equivalent horizontal range (EHR) relevant for hunting up to a distance of 1,200 yards (1,097 meters) when required. With this feature the unit provides the practical angle-compensated distance, which is essential for an accurate long-distance shot. Thanks to its compact design it fits easily into any pocket – weighing just 6.5 ounces (185 grams). The outstanding optics with a 7x magnification ensures the best image brightness and a wide field of view.